Okay, I’ll admit right away that the title of this column is an exaggeration. But if you’re a public policy wonk and you worry about the rising level of government dependency and the erosion of self reliance, then you’ll understand why the chart below, which was presented earlier today at the Copenhagen conference of the Free Market Road Show, is so disturbing. 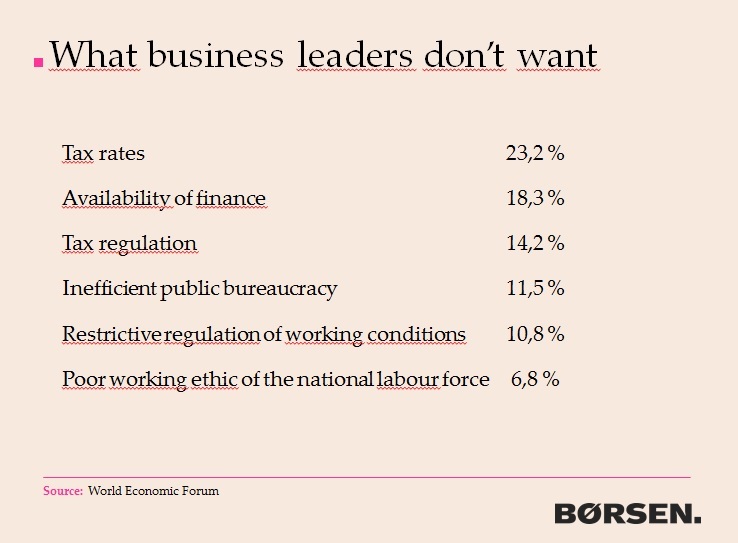 It was part of a presentation by Anders Krab-Johansen, the CEO and Editor-in-Chief of Børsen, which is the leading business newspaper in Denmark. It shows his nation’s dependency ratio, and it reveals that the number of people getting money from the government has more than doubled while the number of people in the economy’s productive sector is stagnant. It’s very hard to be optimistic about Denmark given the trend line (and, please, no complaints about Mr. Krab-Johansen writing “of” instead of “off” since his English proficiency is 99 percent, which is far above my 0.0 percent Danish proficiency). 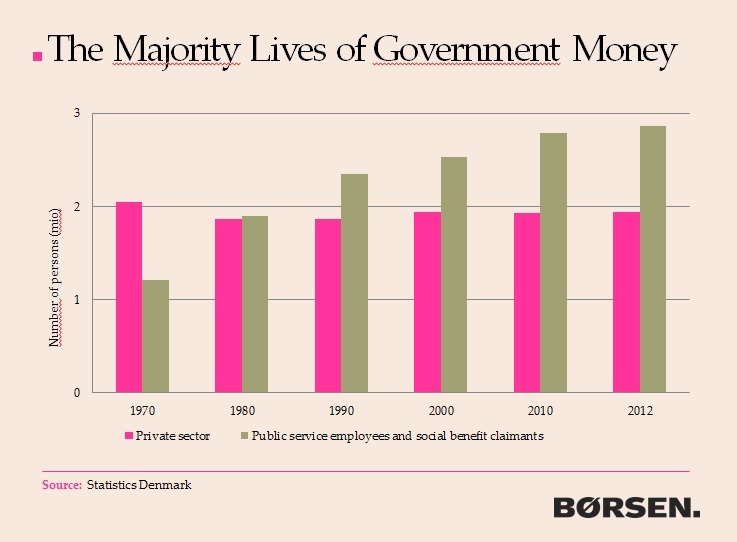 No wonder my Danish friend, Mads Lundby Hansen of the Center for Politiske Studier (CEPOS), put together the “party boat” to show that far too many of his countrymen are living off the labor of an ever-shrinking number of producers in the private sector. It seems that “Lazy Robert” has lots of company. You won’t be surprised to learn that a massive level of dependency necessarily means an onerous burden of government spending. In his presentation, Mr. Krab-Johansen shared this chart looking at consumption spending by governments in the developed world. Spending on core public goods, such as provision of the rule of law, is associated with good economic performance. Other types of government spending, such as outlays for physical capital and human capital, have a mixed record. Some of the spending on things like roads and education is productive, but some of it is wasteful and counterproductive. The bulk of government spending, however, is for transfers and consumption, and those outlays are associated with weaker economic performance. 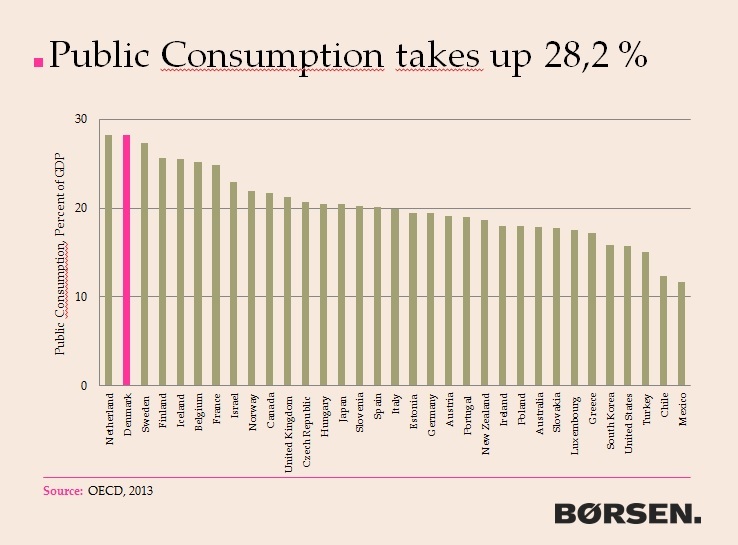 The bottom line is that it’s a very bad sign for Denmark to have the developed world’s second-highest burden of public consumption outlays. And if there’s an excessive burden of government spending, you won’t be surprised to learn that the tax burden is onerous. I’ve previously joked that the tax system is so onerous that birthers should accuse Obama of being born in Denmark. So it’s no surprise that business entrepreneurs identified tax-related issues as being two of their three biggest challenges. It’s also worth noting that bureaucracy and regulation also are listed as problems. P.S. This set of cartoons is the American version of Denmark’s party boat. P.P.S. If anyone cares, my speech at the Copenhagen conference focused on the importance of policies that enable labor, capital, and entrepreneurship to generate economic growth. P.P.P.S. I don’t want to leave readers with a totally grim perspective on Denmark. Yes, the fiscal burden is terrible, but the country actually is very free market in other areas. And the government is even taking some modest steps to reduce dependency, so policy makers realize there’s a problem. I think it is important to remember that the Scandinavian countries have the highest rate of business start-ups in the world, and the highest social mobility. I.e. working you way up happens more in Scandinavia than elsewhere. Its been advanced that this is because the workers taxes in part go to fund a very productive environment for businesses, and partly to the social safety net removing the worst consequences of failure. Contribute and it shall be given unto you. Continually demand that more be given you and you will never have enough. Never. We are becoming a world of takers enabled by politicians and government. This cannot end well.